Brigadier General Dutko was appointed as State Chair for the New Jersey ESGR committee on October 1, 2001 and served two terms retiring on September 30, 2007. He was awarded the National Bureau Minuteman Award for outstanding performance and the Lieutenant Colonel Thomas P. Glen Outstanding Air National Guard Chief of Supply Award. 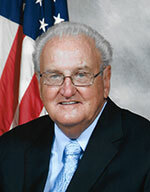 Bob served as the State Chairman of the New Jersey Employer Support of the Guard and Reserve. His civic affiliations include the National Guard Association of the United States and of New Jersey, the Patriotic Committee of Ewing Township, The New Jersey Air Force Association, the Association of The Industrial College of the Armed Forces, the American Legion, the Catholic War Veterans of the United States of America, the Benevolent Protective Order of Elks, The Fraternal Order of Police, The New Jersey Air National Guard Historical Society, and Vice President of the Mercer County Senior Golf League.